“Individually they are Champions. Together, they are The League” –Nfinity Athletics. Level 5 All Star Teams. You’ve heard the hype. You’ve heard they’re elite. You’ve heard they’re amazing. They’re the untouchables. So what happens when they all come together and fight for the title of absolute Grand Champion? They become a league. They become The Champions League. Have you heard of it? For the first time ever Nfinity Athletics is hosting an event to beat all events. They have brought together the best of the best in a 3 day competition to determine who the best of the best really is. 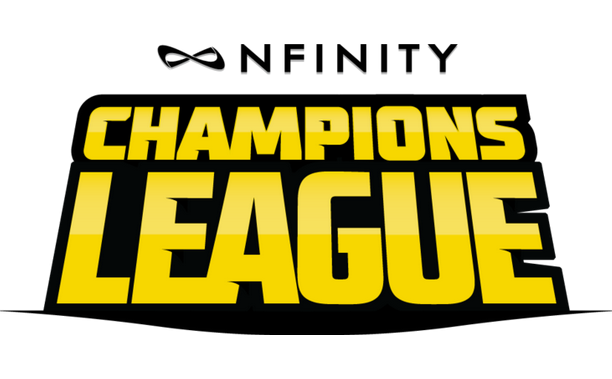 The Champions league is 30 elite teams, Senior teams and Co-ed Senior teams, who will both compete for the division title as well as the title of overall Grand Champion of The Champions League. Quite an honor. This competition will be unlike any other event. It will span over 3 days with Friday kicking off the ultimate fan fest, free for anyone, concluding with The Champions League Prom. Saturday will start the competition. Athletes from all levels will get the amazing experience to compete alongside the most decorated All-Star teams. This portion of the competition will also serve as an exhibition for The League to prepare for the main event later that evening. The highest scoring Senior Level 5 team AND Co-ed Senior Level 5 team from Saturday morning’s competition will be chosen as the wildcards to join The League. During the main event on Saturday night, all 28 teams and the 2 wild card teams will take the mat in front of the judges to compete for the title. Sunday is day two of competition for the All-Level teams and will feature the Junior Level 5 teams AKA “Champions In Training”. Followed by the awards ceremony for all levels to conclude the competition. Not only will one team be chosen as Grand Champion, the Grand Prize will be a charitable donation to the team’s charity of choice. A portion of the registration fees will also be going to charity. Now, how does a team get chosen to be a part of The League, you ask? They are hand picked teams, chosen to represent the tradition and excellence in Level 5 cheerleading. These teams were chosen based on their success over the past decade in other competitions such as NCA, Worlds, and SuperNationals. They were also chosen because of cheerleading fans like you. They all have the unique ability to gain a large fan base outside of their own team. They aren’t just respected and followed in their community, they are respected and followed all over the country. The All-Level competition is open to all programs on a first registered, first come basis. What’s wonderful is that This Champions League isn’t just a one year thing. This will be carried on from year to year acquiring and honoring new All-Star teams. The 4 lowest scoring teams at the end Champions League competition will be subject to replacement by new up and coming teams. This year the competition will begin on April 4th and conclude on April 6th in Atlanta, Georgia. Each year following, it will rotate on to different cities within the US. Now if you’re like us who won’t be able to make this live action-packed event, don’t worry. Just 4 days after the big event, it will be broadcast for the rest of the world to see. Fathom Events will be showing The Champions League for one night only on April 10th in a theater near you. They will show us an exclusive look into the intensity of cheerleading competition. Be prepared for an amazing night of show-stopping teams, incredible cheerleading, tumbling, and simply astonishing stunts. Be prepared to see some fierce athletes in their element. So if you ask us if we’re busy on April 10th. The answer is undoubtedly, yes. See you there. Looking for a theater near you? Head on over to http://www.fathomevents.com/event/nfinity-cheerleading to find one. Want more information on schedule of events, ticket information, and more information on The League? Want to meet the teams?